The Knoodle family is about to celebrate Hanukkah. 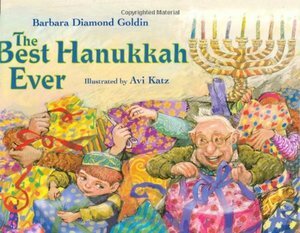 They discuss what the rabbi has told them: "It is hard to give the perfect gift, one that will be treasured forever." What did the rabbi mean? Thinking they’re to give one another a gift they’d really love to have themselves, they pick names from a hat. Bubby Sadie gives Little Yekl a pickle barrel. Mama Pearl gives Papa Jack a straw hat with yellow daisies—something she has wanted her whole life! And so it goes. No one is happy. . . until the rabbi arrives and with Little Yekl’s help, straightens things out. Then they all celebrate "the best Hanukkah ever!" Avi Katz’s illustrations rendered in digital media bring this endearing story about holiday miscommunication to a proper conclusion.